New York Painting Services is a full service painting contractor that is completely licensed and insured to provide affordable services to the commercial businesses and residential homes throughout New York and New Jersey. Our team of artisans is well trained, experienced, and remarkably skilled as they use the high-end products, materials, and equipment to complete your project with superior quality. With New York Painting Services, you can expect professional courtesy, friendly customer service, and traditional values applied to all services we execute with exceptional outcomes. New York Painting Services is well versed in interior design and offers a number of different services that can collectively or individually help you achieve the style of choice for your home or business including Transitional Interior Design. Transition is defined as moving from one place or thing to another; but applying it to interior design in regards to transitional design, is often used to reflect a room’s meshing of modern and traditional elements. Resulting in a cohesive design, transitional design combines 2 styles in one space. This hot new trend is drastically increasing and we would like to offer the basics of Transitional Design to help you get the look you want. Transitional style is a modern mix of classic and contemporary, a simple new idea of an old classic or a hip version of traditional design. Among the millennial generation is where the transitional design is often used. Resulting in a room that is equally masculine and feminine in nature is derived from curved furnishings with straight-lined, lacquered finishes. A clean room with added texture and a neutral color palette as opposed to the scattered, eclectic mess is the essence of transitional style. There are many interpretations of this style and to make it a success, the transitional design should be a seamless mixture of modern and traditional styles. 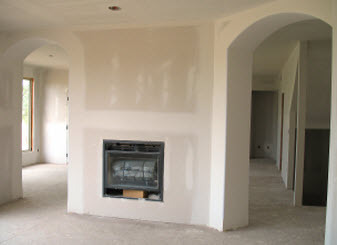 Paint Colors: Neutrals are essential colors because the lines of the furniture are the centerpiece. Paint Textures: Textures are widely used for accessories, furnishings, and so on; lacquer, wood, glass, rattan, fabric, steel and metal. Paint Accessories: Limit the use of accessories as you add artful details through the mixes of styled furniture and fabrics; just avoid confusing the eye. Impactful art is acceptable but lean towards one large piece instead of an arrangement of smaller ones. 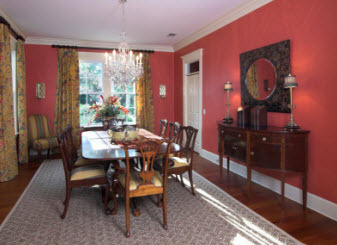 Because Transitional Design can be a bit of a challenge to pull off in your New York/New Jersey home or business, New York Painting Services has included a few examples of rooms done in transition design to get you started. Bathroom: Integrate glass, metal, ceramic and wood for a dash of modern style by featuring a claw-foot tub with traditional tiles in a chevron pattern. Bedroom: A curved headboard with tufted upholstery for traditional points with a steel-gray fabric to add modern touches is a good example. Dining Room: Upholstered chairs in a traditional fabric with an otherwise modern dining table and chairs with steel pendants with exposed light bulbs for a modern offset is ideal. Kitchen: For kitchen’s already equipped with traditional cabinets, consider adding contemporary pendant lights over your island along with steel countertops can also add a contemporary look to an otherwise traditional kitchen. Living Room: With traditional architectural features such as trims and moldings, keep the fabrics warm yet neutral in color and add clean-lined chairs and sofas. 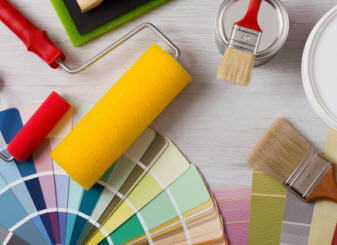 When wanting to get your home or business in the New York and New Jersey area fitted for transitional interior design, call in the specialists of New York Painting Services and let our experts get started!